Here’s a topic I am intensely interested in: the early lives of people who are later viewed by society as “crazy.” What were these people like before they went over the edge? Were there obvious signs of mental illness that were somehow masked by youth, beauty, or wealth? What ultimately led to these people’s losing their grip on reality? Was it a long-standing chemical imbalance? Traumatic life event? Descent into poverty? Basic inability to cope? Dependency on drugs or alcohol? A combination of the above? I admit I have some very personal reasons for being interested in this topic. Every time I see one of those crazy people on the street, the ones who are invisible to most passersby, there is a moment when I think to myself, “there but for the grace of God…” Let’s just say that there is a more-than-generous dollop of mental illness in my gene pool. I think I’ve written about my father’s mother who was institutionalized from the time he was a little boy until her death when I was 18. Because there was such shame around mental illness in those days, the very questionable decision was made to not tell me and my siblings about her until she died in the 1970s. My father told stories about her from his childhood and always said how much he loved her but I had assumed she died long before I was born. I saw her for the first time at her funeral and couldn’t help but wonder about her life and circumstances before she lost touch. I’ve always had a strong attraction to the mentally ill. Without mentioning any names, I’d have to say that my favorite relatives growing up were the people who my more “normal” family members would say were a few cards short of a full deck. Let’s face it, crazy Auntie Mame-types are always more fun, especially for an uptight kid who had already learned to suppress most of his feelings. I would dutifully play my part of the “good little boy” at all family events while secretly envying my family members who were volatile enough to break from the rules and cause a “scene.” I saw being crazy as a kind of freedom, a liberation from the stifling norms, even though I simultaneously feared the loss of control it seemed to bring and I certainly didn’t envy the ramifications of such behavior, including, in some cases, being forcibly committed. 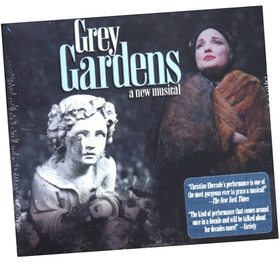 I’m on this bender today because I just downloaded the CD from the new musical “Grey Gardens” that opens on Broadway next week. It’s based on the 1975 documentary by Albert and David Maysles about the aunt and first cousin of Jacqueline Kennedy. In the film, now a cult classic, we meet Edith “Big Edie” Beale, sister of Jackie’s dad, “Black Jack” Bouvier, and her daughter “Little Edie” who was once one of the most sought after young socialites in New York. By 1975, elderly Edie and her middle-aged daughter were recluses living in a decaying 28-room mansion called Grey Gardens in East Hampton, New York along with 52 cats, several rabid raccoons, and an occasional rat. The Suffolk County Health Department had declared the home “unfit for human habitation” in the early 1970s which caused Jackie O. to step in and pay for a cleaning and partial renovation. By the time the Maysles brothers arrived a few years later, the mansion was once again in an appalling state. Throughout the film, the love/hate relationship between Big Edie and Little Edie is apparent. While the filmmakers were later dogged by accusations that they were exploiting the Beales, it’s clear that they had a great affection for their subjects and that the women loved being in the spotlight. Seeing them living in such squalor after having once been the toasts of New York society, I couldn’t help but think of the social, physical, and mental freefalls experienced by other well-to-do American families, including my own. When I first heard that someone was writing a musical based on the documentary, I thought it was insane. How would that be possible? What was the point? I haven’t seen the play yet (which had a successful off-Broadway run earlier this year), but I was completely transfixed by the CD from the moment I played it. It’s rare for me to go that nuts for a score the first time I hear it but I was amazed at the way the emotions of these complex characters were so perfectly conveyed through the songs (written by Scott Frankel and Michael Korie). The fact that both Edies were intensely musical during their lives and were frustrated singers in their own right helps a lot. Big Edie died in 1977 but before her death in 2002, Little Edie gave her blessing to the planned musical of the film—she loved the idea. 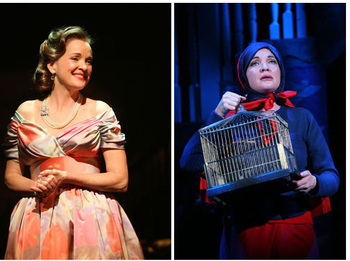 “Grey Gardens” the musical is two plays in one. 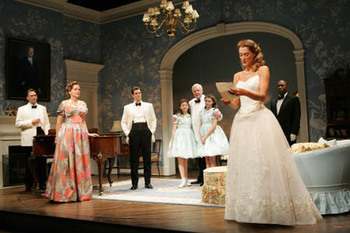 The first act takes place in 1941, during the heyday of the Beale family when their mansion was well staffed and boasted the finest gardens in the Hamptons. What a brilliant move to take the older Beales, as documented in the 1975 film and work backwards 30 years to a time when they were young, attractive, and accepted by society. While the first act plays like a high-spirited Cole Porter musical, it’s impossible to miss the heavy strands of dysfunction that crisscross the seemingly carefree lives of mother and daughter. Every hopeful moment in the first act is made all the more poignant because of our knowledge of how these dynamic characters ended up. Jackie Kennedy and her sister Lee Radziwill are characters in the play, little girls, aged 12 and 8, who are in awe of their kooky, talented aunt and beautiful cousin. As the musical opens, the older Edie is busy preparing Grey Gardens for a glittering party honoring her daughter’s engagement to Joseph Kennedy, Jr., bright star of the Kennedy family and older brother to Jack and Bobby. Although the two dated back in the day, I’m not sure if they were ever really engaged, but Joe Kennedy is another poignant character, since we all know he will be cut down in his prime when his plane goes down towards the end of the war. Little Edie was a debutante and model in her youth, known by the nickname “Body Beautiful Beale,” and besides Kennedy, was supposedly courted by J. Paul Getty, Howard Hughes, and two of the Rockefellers. In the end, their eccentricities led both Edies into seclusion, dumped by the society families that once clamored for their attention. 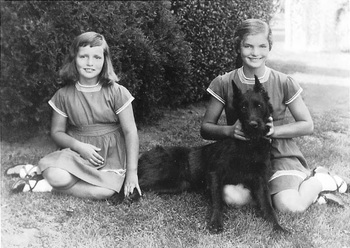 Little Edie was dropped by the Kennedys even before Joe’s death while Big Edie was abandoned by her husband and disowned by her own family, the Bouviers. Big Edie received no alimony from Mr. Beale but she was allowed to keep Grey Gardens, the palatial home that slowly withered around her since she could not afford to keep it up. In the early 1950s, Big Edie summoned her daughter to Grey Mansions to take care of her, thus beginning the co-dependent relationship that would comfort and torture both for the next two decades. Can a Tony Award be given to an actress before a play opens on Broadway? Can it be awarded by someone who has never even seen the play? Christine Ebersole deserves all the honors that will come her way for this amazing career-altering tour de force. 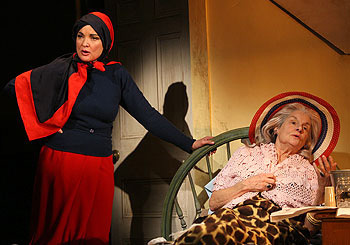 In Act 1 she plays Big Edie at the age of 45, at the height of her power as the Society Matron of Grey Gardens, just before it all goes terribly wrong. We see her embarrassing Little Edie with her outrageous songs (including a minstrel number called “Hominy Grits”) and irritating antics that eventually spell doom for the union with the Kennedys. In Act 2, Ebersole plays Little Edie at age 58, with all hopes for her glamorous life and well heeled suitors long gone. A feature film version of “Grey Gardens” is now in pre-production with Jessica Lange as Big Edie and Drew Barrymore as Little Edie. Their life stories have become something of a cottage industry, Little Edie would be so thrilled. I am fascinated by these tales of lost potential, of people who are trapped in their circumstances and see no way out. The Beales of East Hampton were like two modern-day Miss Havishams, sitting in their faded, dusty finery and waiting for the crowds of admirers who would never come. Except now they have. As I sit here pouring through boxes of old family memorabilia, spending hours researching obscure elements of L.A. history, or immersing myself in the brilliant hues of a technicolor fantasy, I wonder if I’m really all that different from Little Edie Beale and her quivering grasp on reality. What really separates me from the crazies of this world? My ability to limit most of my ramblings to my blog instead of accosting strangers on the street? Fascinating, and I'd love to see this production. While I've grown to not be afraid of those who have illnesses, from cancer to HIV, I have to admit an uncomfortableness with mental illness. When I see someone "crazy" on the street, I feel sympathy, but also fear that if things were different in my life, I could be this person -- and I want to be far away. Mental illness scares the crap out of me. My own father was not the most balanced person, I always refer to him as a depressive hypochondriac. He was never institutionalized but, at times, was barely functional due to severe bouts of depression. i know that I have inherited those genes, and that's not a happy thought. I had never heard of this movie, this musical, and this story, and will check it out further. Thanks again for another great post! i like movies very much,and saw a lot of films,but never saw this one,thank you for your introduction and recommendation,i will check it out. What a wonderful post Danny! I understand your feelings very very well...It seems to me more of the world walks around just on the edge of madness or fearing it than not! I bought this cast recording because I love Christine Ebersole's voice... and was not disappointed. Ebersole is certain to get a Tony nod, if not a win. And I was surprised to hear about the upcoming version with Jessica/Drew. That should be fascinating. I enjoyed reading this post, hearing the background and history that goes along with the musical. I feel like I understand it on another level now. Great post. Enjoyed the post -- and can't wait to see the show (although I may have to). Loved this post, Danny. I know I've always felt an attraction to the less stable members of the family. I had one great aunt who left Iowa and came out to Los Angeles as a young woman and her parents were so outraged/concerned that the entire family followed her out here. As a child I inherited her stuff which no one else valued including her castenets, dancing skirt and a chinese sewing kit. Also a few items of nice clothing she purchased and never wore with the Hollywood boutique tags still on. The oldest members of the family seem to hush up when her name is mentioned, but honestly they probably don't remember much about her. I'm sure her life was interesting though. Wish I had met her. I found your post so intriguing that I ordered both the dvd and the soundtrack. I've just finished watching the documentary, and I was absoutely transfixed! What an interesting mother and daughter relationship! I'm telling all my friends about it. I'm looking forward to seeing the musical as well. 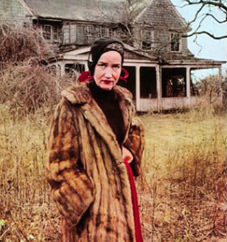 I would love to see all types of photos of Grey Gardens and it occupants before and after the madnes. What an amazing story, I loved watching the 1975 doc and at the same time was horrified by it. It definately is one story that has changed my life, what a fragile life a mere human leads and the choices we make can alter our futures. Little Edie if you have your time back "Dont go home to Momma"
I just saw the play (finally) and was completely staggered by it. I'm not surprised though, I've been a fan of Christine Ebersole since I first saw her as Guinevere in a revival of Camelot that starred Richard Burton who seemed to me to be sleepwalking through his performance. I'm not sure of the year, maybe 1978 or '79. Not long before he died. Though very young at that time Ms. Ebersole virtually rescued the show single handed. Also, enought cannot be said for Mary Louise Wilson's spot-on brilliant work in this piece. All in all this was quite possibly the best thing I've ever seen on (and Off)Broadway. I saw the musical last weekend and immediately rented the two documentaries (1975 and 2000). As much as I was impressed with Christine Ebersole's performance, I was more interested in learning more about the real Little Edie. The documentaries were amazing. Yes, Little Edie was unconventional, but I don't think she was crazy. She had acclimated herself to living in the situation she was dealt. In a large aging house house, little money and a sick elderly mother, Little Edie somehow always managed to smile. I wish we could all be that sane. I've been a huge fan of Christine Ebersole's since my first day of college. I went to MacMurray College in Illinois, and my first day there I strolled into the student union and the first thing I saw was Christine Ebersole (age 18 I suppose) sitting there playing the guitar and singing. She was amazing then, and she's amazing now. Her performance in "Grey Gardens" is mind-blowingly brilliant. What a GEM she is.